ABC News is bringing iconic symbols of the British royal family to mobile devices to help viewers celebrate the May 19 wedding of Prince Harry and Meghan Markle, according to a company announcement. The Royal Wedding AR Experience lets iPhone and iPad users see 3D models of the royal wedding carriage and a queen’s guard in augmented reality (AR). Users can adjust the scale of the models with pinch gestures on a touchscreen, then snap pictures and video of the experience to share with others. People who use the #RoyalWeddingAR hashtag when posting the images on social media could see their photo appear on ABC News’ show “Good Morning America” leading up to the wedding on Saturday, when live coverage begins at 5 a.m. Eastern. While ABC News’ AR app is whimsical and fun, it doesn’t appear to add much value to the news coverage of the royal wedding. What it could do, however, is lead more people to download the iPhone app — the same one on which the company delivers its news. Once people have the app and engage with the AR feature, perhaps they’ll stick around after the wedding and browse the media company’s news content. Royal weddings are major media events around the world, even among people who don’t typically follow palace intrigues. ABC News hopes to leverage this global consumer excitement and engage people in its coverage with its latest entertaining AR features. An estimated 3 billion people worldwide, including 23 million people in the U.S., watched the 2011 wedding between Prince William and Kate Middleton, and analysts have predicted that Prince Harry’s upcoming wedding may draw even more interest in the U.S. with his marriage to Meghan Markle, an American actress. By comparison, Sky News in the U.K. partnered with Amazon Web Services, GrayMeta and UI Centric to add a feature to its mobile app and website to help viewers identify guests as they enter St. George’s Chapel for the wedding, per a blog post. 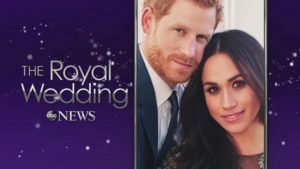 The “Royal Wedding: Who’s Who Live” function lets viewers select a guest during the live stream to learn more information about that person and further participate in the festivities through their smartphone. ABC News is among the media organizations adding AR to their mobile capabilities to deepen engagement with loyal viewers. Sports Illustrated in February published its popular annual swimsuit issue with a promotion that included a Snapchat World Lens that brought the print pages to life through AR and virtual reality. The New York Times published an AR experience for the Winter Olympics in Pyeongchang, South Korea, to display behind-the-scenes content of athletes and sporting events. Additional news organizations and other companies are likely to begin incorporating similar AR experiences into their coverage after both Apple and Google launched respective software development kits to make it easier and less resource-intensive for app developers to add immersive features to apps.